Origin / Japanese. Pichi comes from pichi pichi, which is the onomatopoeia describing splashing in puddles. Also a reference to the lyrics from the Japanese children's song Amefuri. Origin / Japanese. Pitch comes from pitch pitch, which is the onomatopoeia describing splashing in puddles. Also a reference to the lyrics from the Japanese children's song Amefuri. English. Pitch might also come from pitch, which is the substance created from dead plankton. 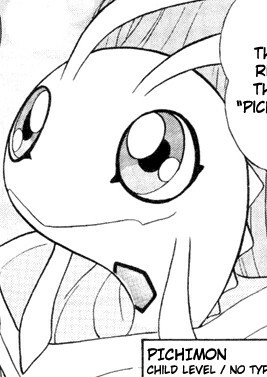 Note-1 Almost every Digimon in this game has three attributes. One attribute uses the correct color scheme and the other two attributes create D-Project Recolors. 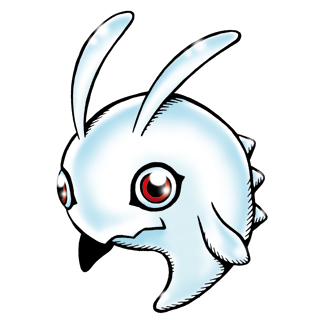 This Digimon has no attribute, but in D-Project the Data version uses the correct color scheme.